In this case, strain features of an acute inferior myocardial infarction caused by a RCA occlusion are presented. A 53 year old man was brought to the emergency department because of persisting symptoms of angina pectoris accompanied by perspiration and dyspnea in rest. Initial ECG showed ST elevation in the inferior wall and reciprocal ST depression in leads I, aVL, V1-2 and 5-6. Blood samples showed an increased level of troponin (334 mmol/L). Subsequently, an emergency coronary angiography was performed and the occlusion of the (dominant) RCA was treated by PCI with a drug-eluting stent (see figure below). After the intervention the patient was free of symptoms. Both echocardiographic images with strain analysis and MRI were obtained in the acute phase and after 6 months follow up. The results will be discussed below. Echocardiographic findings in the acute phase showed a moderate LV systolic function (LVEF 50%). Hypokinesia was seen in the inferoposterior region. Except for mild aortic- and mitral valve insufficiency, there were no abnormalities. Strain analysis by 2D-STE in the acute phase presented the following. Global longitudinal strain was -12.6% (markedly reduced). 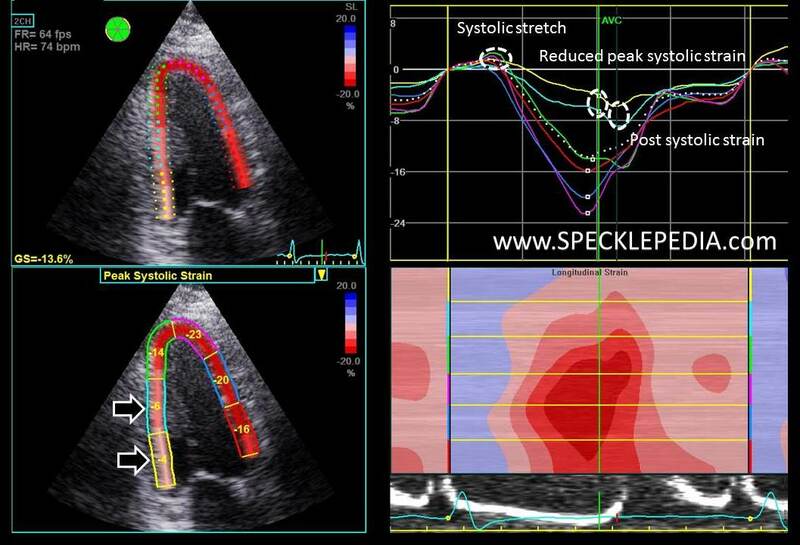 Segmental peak systolic strain was reduced in the inferior region and basal segments of the septum and posterior wall (indicated by the white dotted line in the bulls-eye), corresponding to the dominant RCA territory. Those values ranged from -10% to -4% (indicated by the yellow circles in the graphs. A cutoff value of -12% for peak systolic strain can be used to identify segments with expected infarction. This would imply that the infarction is located in the inferior and posterior wall ranging from basal to apical. Presence of post-systolic shortening (PSS) and early systolic lengthening (ESL) are indicators for impaired contractile function of the myocardium. 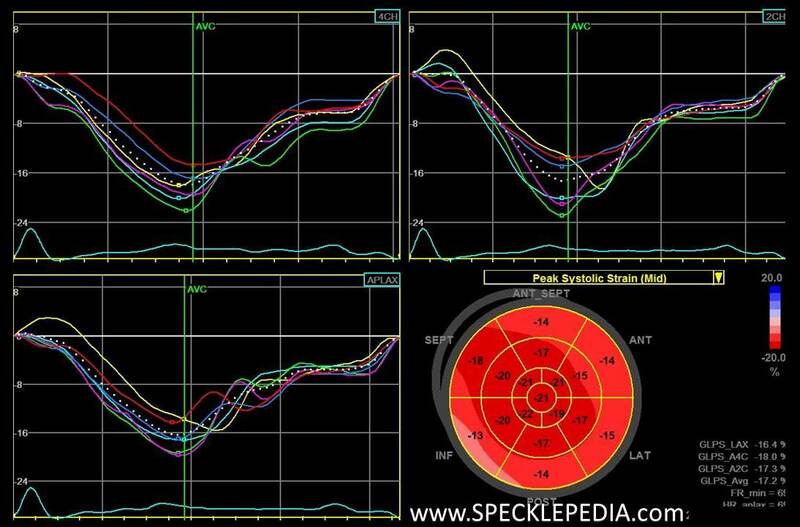 PSS (see “post systolic index” bulls eye) and ELS (see “pre-strech index” bulls-eye) was found in the inferior and posterior walls, similar to the areas of reduced peak systolic strain. Based on these results, the prognosis regarding functional recovery of the myocardium is difficult to predict, since both LVEF at baseline and global longitudinal strain are close to cutoff values for LV remodeling and functional improvement. After 6 months follow-up echocardiography was repeated. The LV systolic function was comparable to baseline, with a LVEF of 50%. Other findings included minor concentric LV hypertrophy and hypokinesia in the basal regions were observed. 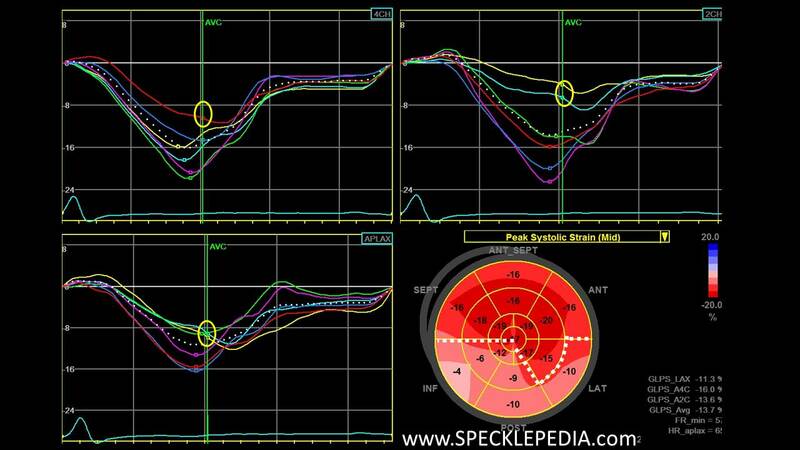 Compared to the acute phase, peak systolic strain improved in all segments. This improvement was most pronounced in the inferior and posterior wall. The apical and midventricular segments showed an almost complete normalization (see second figure below. The yellow graph corresponds to the basal inferior segment). 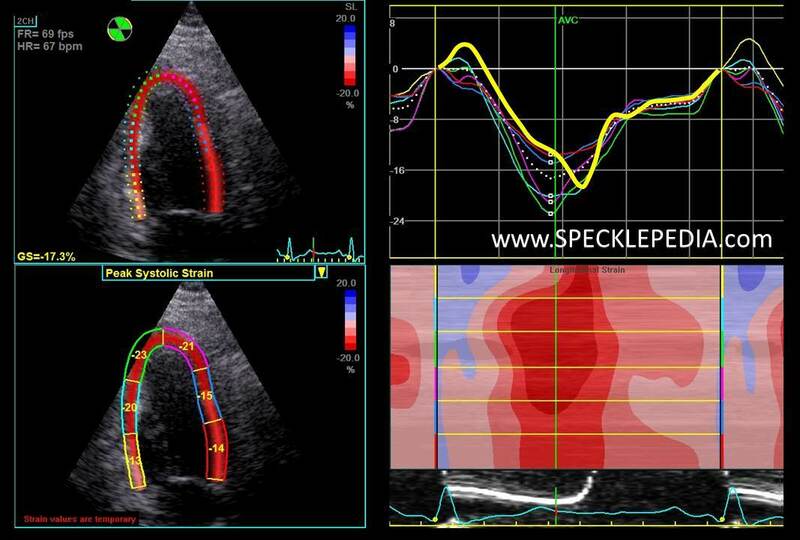 The slightly impaired peak systolic strain in the other basal segments can therefore be explained due to stunning. PSL and ESL at follow up were observed in basal inferior wall. Those two parameters represent a higher amount of fibrosis. MRI results after 6 months showed an LVEF of 48%. There was hypokinesia in the inferior wall (with some degree of wall thinning. 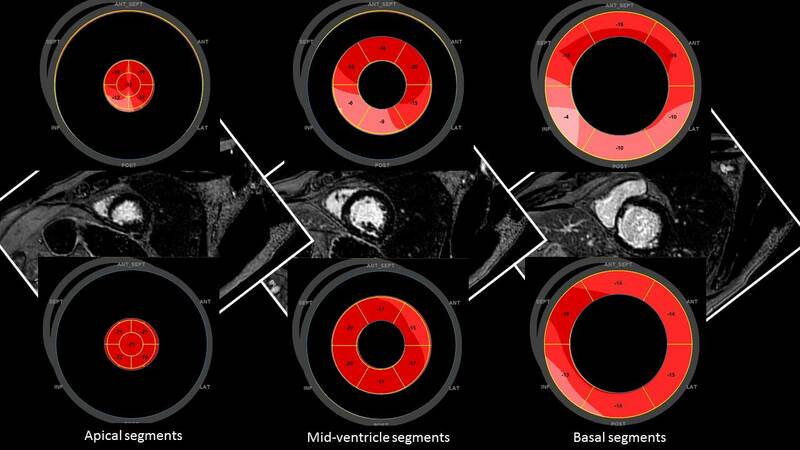 Delayed enhancement showed subendocardial damage (less than 25% of the myocardial thickness) in the basal segments of the inferoseptum and posterior as well as midventricular inferior. There was approximately 50% delayed enhancement in the basal segment of the inferior wall. These findings correspond to the persistent reduction of peak systolic strain values in these segments.